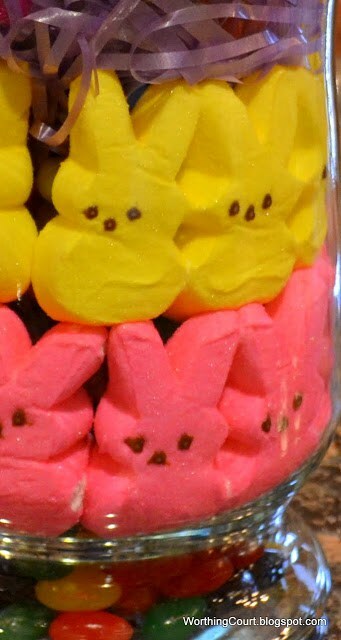 Who doesn’t love a good Peep? I do, so I thought I’d give you a peep (pun intended) of a little something that I put together for my daughter and her family. I’ve seen these all over blogland and Pinterest and here’s my version. I started with a layer of jellybeans since my container gets narrower at the bottom. 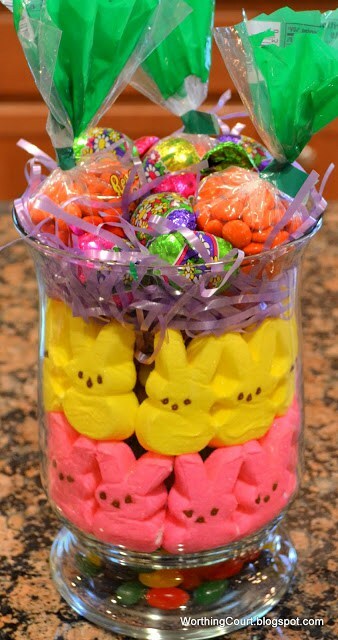 Then just added Peeps around the outside, filled the center with the rest of the jellybeans and added some Easter grass and chocolate eggs wrapped in colorful foil. Lastly, I “planted” some carrots filled with Reece’s pieces. Wrapped it all up in a plastic bag, added a bow and some flowers from Dollar Tree and called it done! I pray that each one of you will have a very blessed and joyous Easter! We all have fun presenting our friends and loved ones with Easter baskets and other gifts, but remember that Christ gave the greatest gift of all when He gave His life on the cross so that each and every one of us can have eternal life! 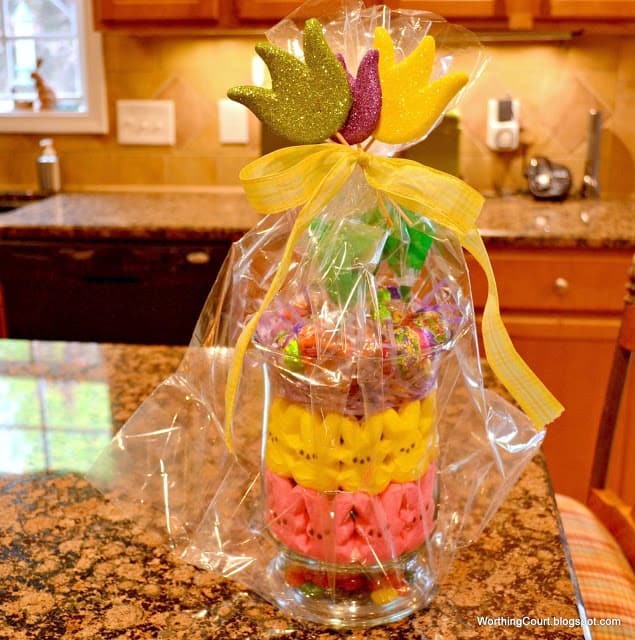 Love the gifts with candy for Easter! 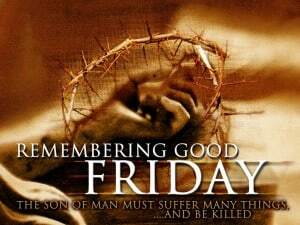 Yes we must all remember that Christ paid the ultimate price so we could have eternal life. Happy Easter to you and your family Suzy! Love this I love the peeps. It is really pretty. Happy Easter! This is darling. I went by the peps last nite at the Kroger store and had to get a package. So sad yet so good. Richard from My Old Historic House. Yummy,yum,yum! Hoping to see a post or two of Miss J’s house soon….and can’t wait to see your finished bookcase at the beach! Hope you have a blessed Easter! We’re hoping our new grandson will arrive this weekend!! Love your Peeps! I know the family will be thrilled.